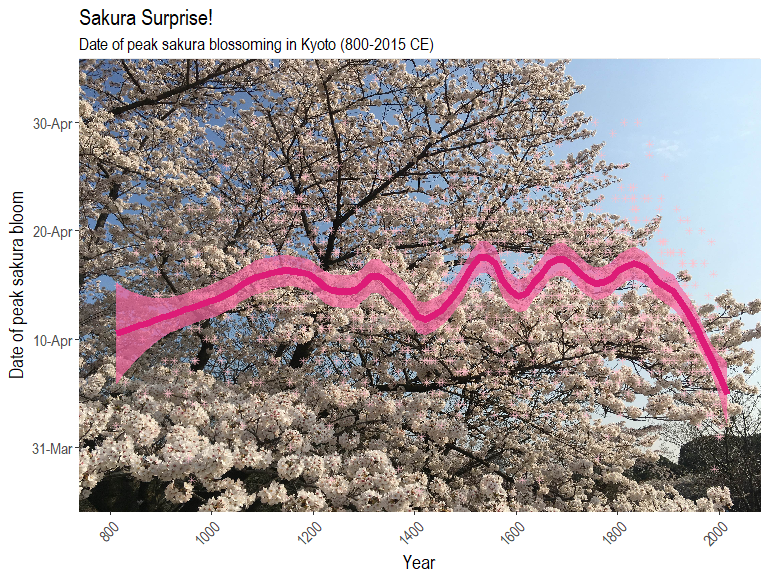 Sakura Surprise: Cherry blossoms in Kyoto blooming earlier in the past ~100 years! For this article I will try to recreate this graphic but with a few tricks of my own. Thankfully the raw data is made available by the original author of the research paper documenting this phenomenon, Dr. Yasuyuki Aono from Osaka Prefecture University. The data set can be downloaded from here. Much better! Now let’s separate the column containing our three-digit date data into individual month and day columns. After converting the full_flowering_date column into character format, we can use regular expressions (regex) to parse the character strings of the date and then separate the month digits and day digits with a . period symbol. Using the make_date() function in the lubridate package we can create a separate variable in YYYY/MM/DD format. You can also format the individual date components into their own variables if you wish. Now we are ready to plot! 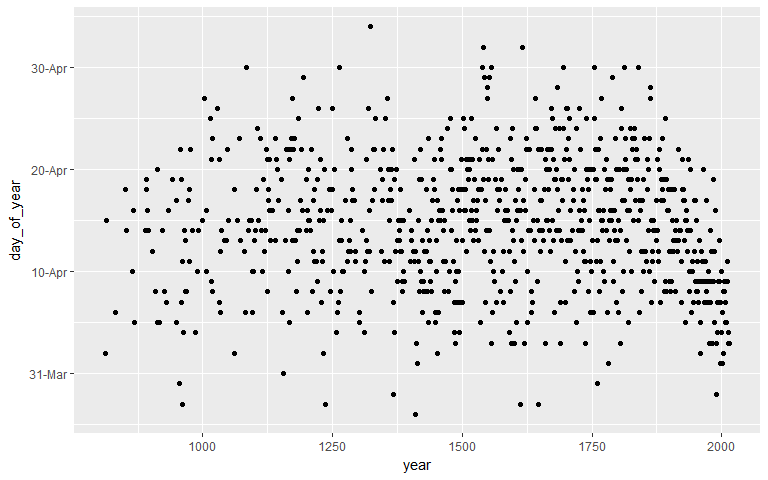 We can pass a function in the labels argument in scale_y_continuous to format the y-axis to show the date in a Day/Month format. Looks better! 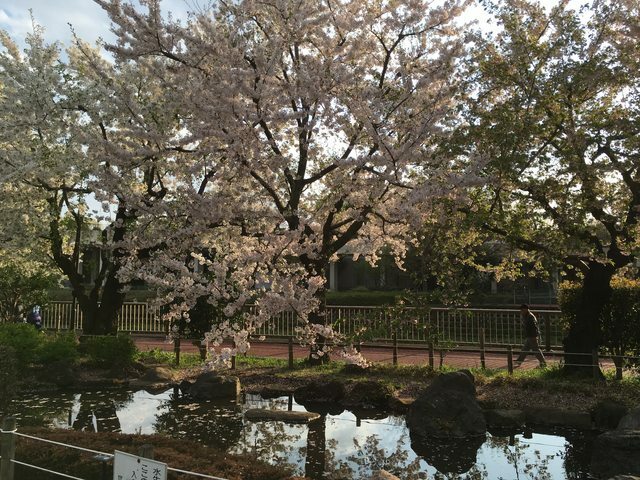 Now we can clearly see the trend of the sakura blooming date over time! But could we make it more… sakura-y? Better! But, the colors don’t look good on a drab grey background… So let’s add a background image! 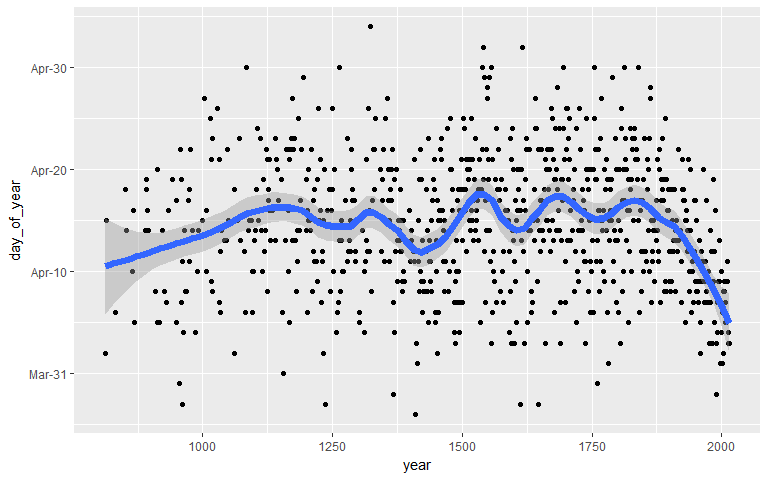 Normally, you would never add in a background image to a plot as it would obscure the individual data points and other details. However, for this post I wanted do something slightly different from what The Economist did and I’ll make it so that you can still clearly see the trend line despite the background image! We can add in a background iamge by utilizing a variety of packages such as jpeg, grid, and gridExtra to download an image from the internet, turn it into a raster, and then place our ggplot on top of it! 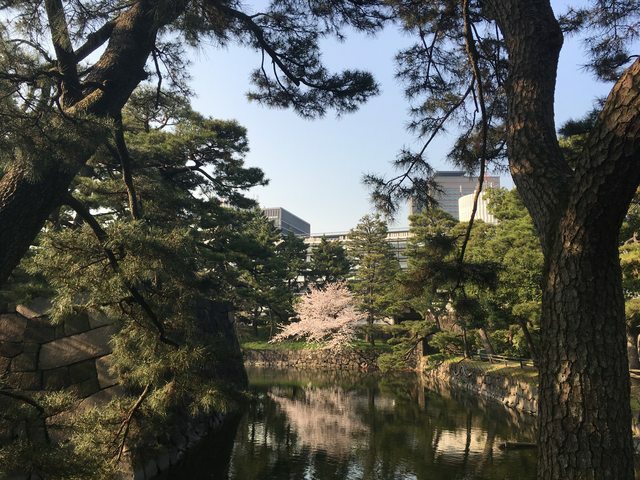 When I originally created this viz last year, I just used an image taken from Google, but this year I went to the Imperial Palace East Gardens and took a few pics of the beautiful cherry blossoms there to use for this plot! You can use the code to try it out with other pictures as well. 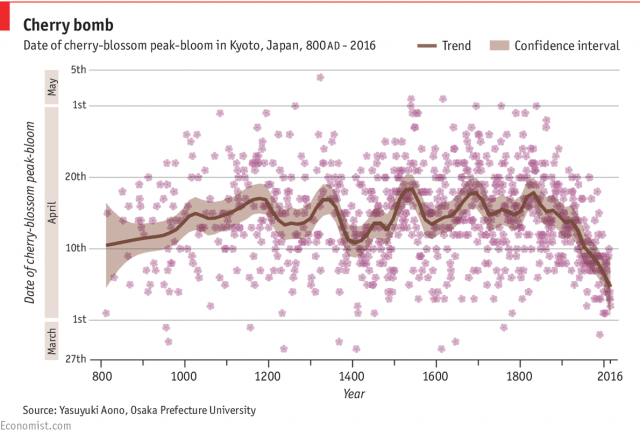 We can see that the full or “peak” blossoming date for sakura has come earlier and earlier in the year since the 20th century! 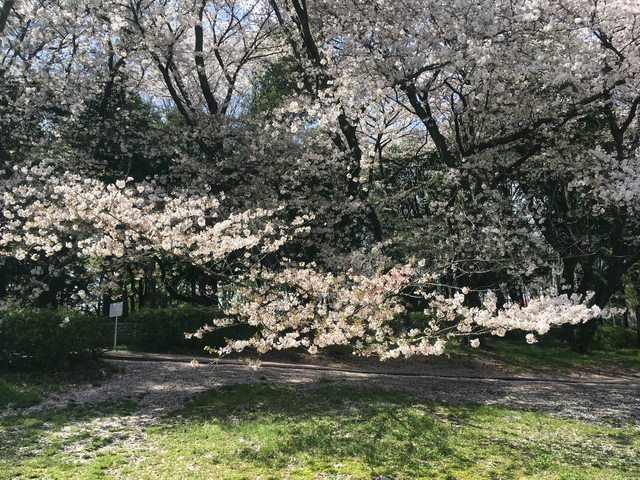 In their article, Dr. Aono and Dr. Kazui used the historical records of Kyoto’s blossoming date to predict temperatures in March to within 0.1 degrees Celsius. 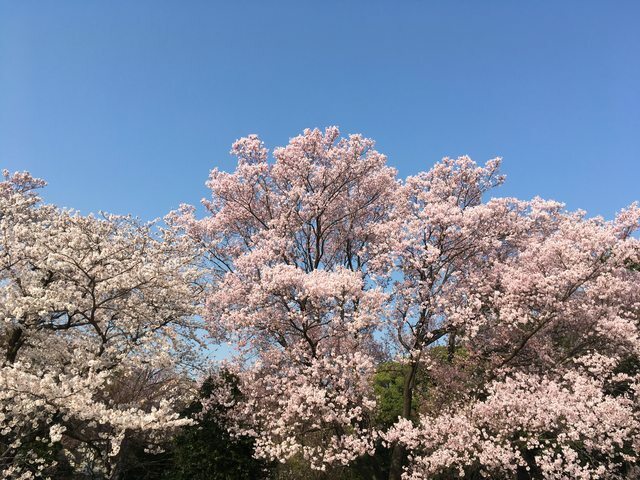 As cherry blossoms decide when to bloom based on the temperatures in February and March, it is quite telling that in recent decades the blossoming date has come earlier in the year! Some other cool uses of Dr. Aono’s sakura data set include this visualization done by Christoph Safferling from “Opiate for the masses” where he incorporated sakura emoji as the data point shapes; definitely much better than the ersatz geom_point shape I used as “sakura” for my own plot! 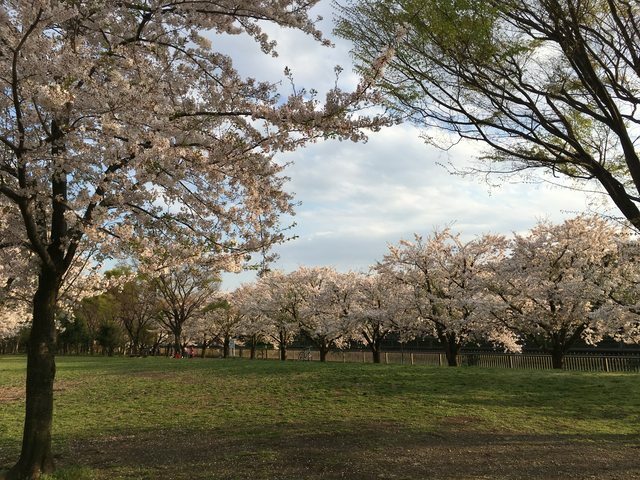 The date of peak blooming is different depending on the region, usually the northern parts of Japan have their peak blooming date earlier. 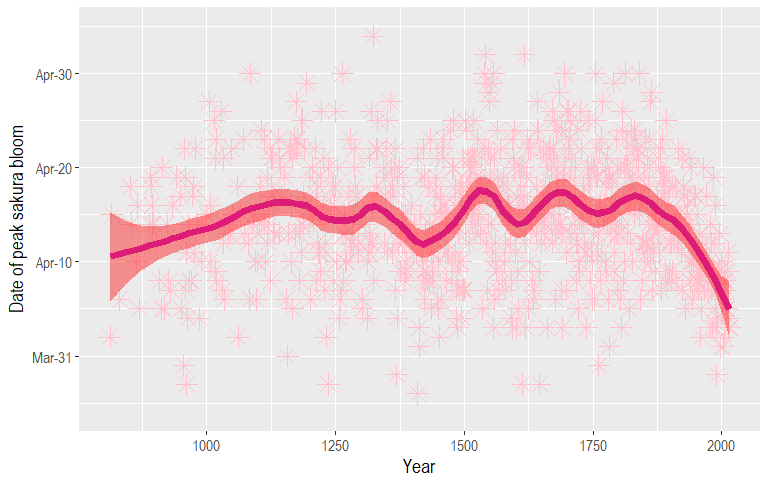 It would be an interesting project/idea to make a visualization comparing the peak dates across Japan! Maybe as some kind of cascading animation? 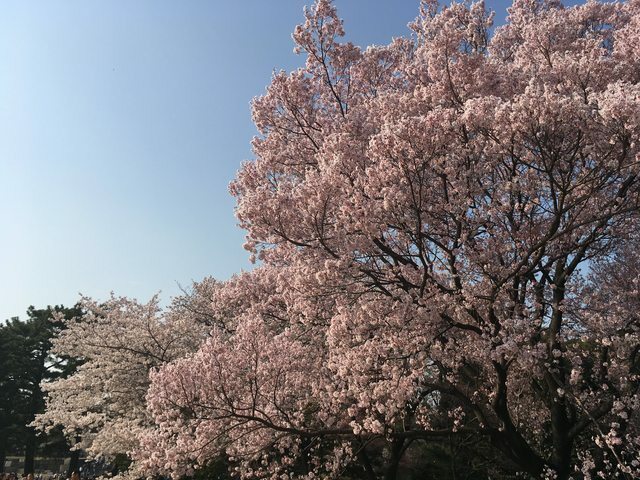 To cap off, I’ll leave you with some photos I took of sakura in Tokyo when I went back home for Spring Break back in April (2017)! A few more from this year, 2018!